OI-6940 Sensor Assembly Stand - Otis Instruments, Inc. The Otis Instruments OI-6940-ST is a two-wheeled stand engineered specifically for use with the OI-6940 Notis Quad Sensor Assembly. 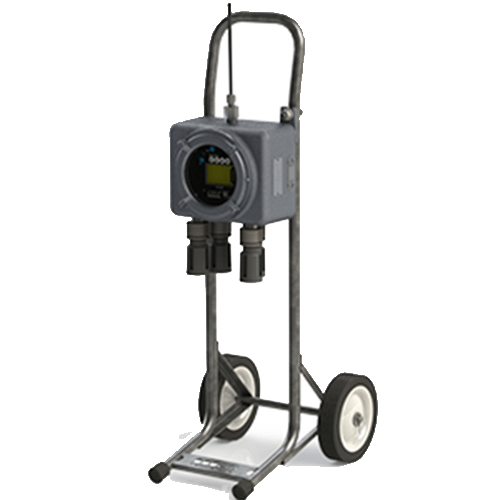 The unique hand cart design of the OI- 6940-ST enables the robust OI-6940 sensor assembly to be easily transported while in the field. Pre-mounting of the OI-6940 sensor assembly onto the stand eliminates the need for on-site mounting. Simply place the battery-powered WireFree OI-6940 sensor assembly and stand in the desired location and power on the device. • Maximum Load: 100 lbs.